Today in “Blushing Bride” I have a very special person; someone who has been always there for me, no matter what or when, someone who knows where I have been and knows where I dream to go. She shared my happiness and has also been my close companion on lonely days. 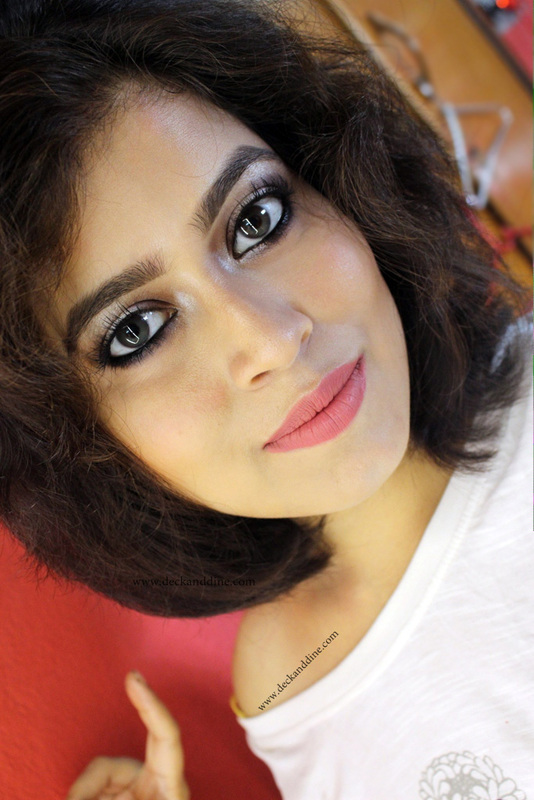 And today it gives me an immense pleasure to feature her in my blog. Our meeting was a filmi one. On the sets of “Royal Bengal Superstar – Star Jalsha” in the year 2009. I was working for this production house in Kolkata and we started working with a Mumbai based production house for “Royal Bengal Superstar”. I was initially involved with the participant’s part of the project and that’s when I met Prantik. He was in the champion’s team and their rehearsals, etc were being scheduled by me. Seems unbelievable now but when we met I was scared to death with him. He was always picking up fights with me being a brat. He would literally scare me off every time I even opened my mouth to say something. I was convinced he is a mean man and kept my distance. I remember asking others to tell him of rehearsal timings coz I was too annoyed with him and refused to speak to a brat. Haha.. I don’t even remember when we became friends when we started talking and when the night time conversations started ending in the wee hours of the morning! Well – Cupid is to be blamed and thanked for the rest! He went on to win the show later and I say this to imply I got a lot of time with him thus during the show and got to know he was not a brat after all. I had almost a year to plan for the wedding technically. But I was in Mumbai, my mom in Noida and Grandparents in Kolkata. 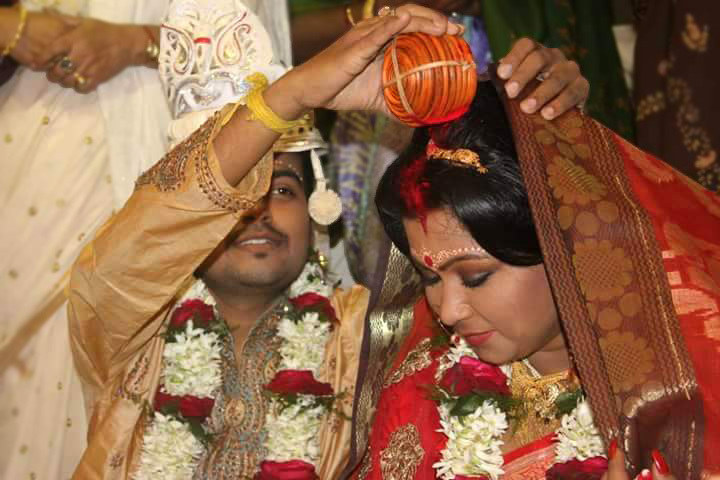 The marriage was to be in my hometown Kolkata - it was a mad frenzy. I had turned into a shopaholic for a year almost. I was shopping accessories for the tottyo from online sites and every day there was some parcel at the office on my name. 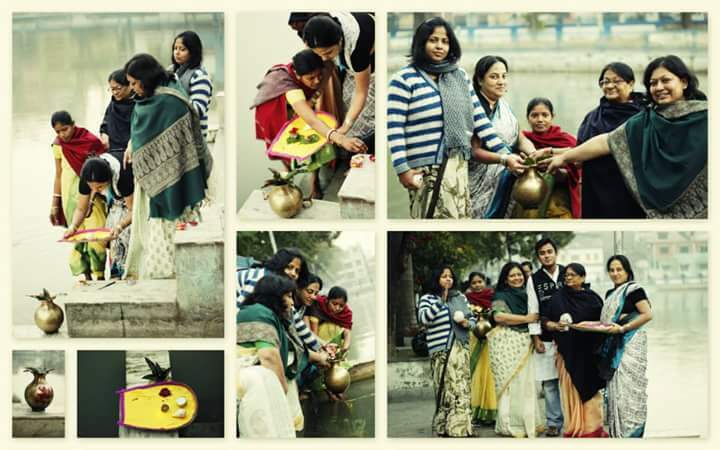 Saris, jewelleries, shoes all from online sites. Thank god for the technological advances else I would have had only 2 tottyo trays probably going to the in-laws. Everyone in my office thought I had completely lost my mind. I even designed a set of invitation cards online for inviting friends and colleagues in Mumbai. I designed it on Vistaprint.com and got it printed online. However the real wedding card was handwritten by my grandfather in Bengali and English. That was a dream I have had since I was little. My mom’s wedding card was also written by hand by him and printed. I always wanted his touch to dominate the card and it was a very special moment when I held the first card which was sent to me by courier by him. My colleagues in office gave me a joint aiburobhaat just before I came for the wedding to Kolkata. It was a potluck aiburobhaat. So, there I was in Mumbai shopping for jhumkas and dupattas and what not online and in Delhi was my mom doing the same. She too was going all bonkers what to buy and what not to buy. She went ahead and bought a humongous amount of cosmetics for me and then didn’t know how to bring back all that she had bought in Delhi to Kolkata. We both were going insane coz we both like to buy accessories as such and we both are a little crazy. It was fun tough sharing photographs of latest buys with my mom and she too became awfully tech savvy coz she was sending voice notes and pictures and what not of her purchases. I came to Kolkata 10 days before the wedding and the last shopping trip was to Esplanade and Gariahat, where we picked up bags and knick-knacks for the tottyo and some other stuff. Each sari for the tottyo had a matching bag, an accessory and some other knick knacks color coordinated and matched to the T. Finally we realized we were over burdened with things and it was time to stop. We had shopped enough for two weddings it seemed. The sari was the first thing I bought after our dates were finalized. I really wanted a different offbeat sari for the wedding. 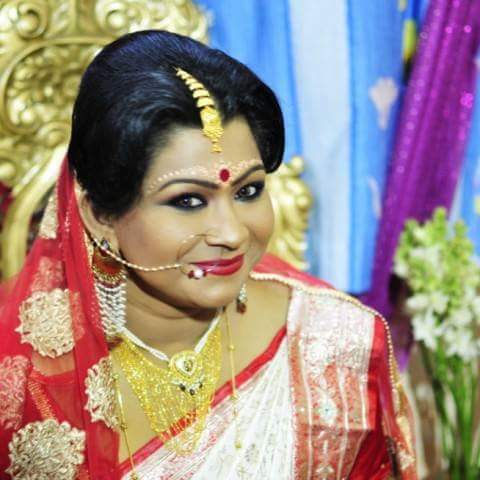 I remember telling my mom that I wanted to wear a red cotton dhakai sari in ath-pouro style with gold jewellery and a hath khonpa with a big sindoor bindi and kohl lined eyes… My mom’s expression on hearing this remains indecipherable till date. She said I was suffering from insanity. So I was dragged to the shop to buy the trousseau tough with a promise from mom that I would be allowed to buy a red dhakai too. And I did. My sari was from Benarasi Kutir and it was love at first sight. It was a “shada sari lal paar” - a benarasi in white with red pleats, pallu and border adorned with real zardozi-zari work on it in silver and real gold. I remember the look on my mother’s face when the sari was draped on to me at the shop. I did not even need a mirror to look at myself. I knew – This was it. Being in Mumbai I took full advantage of the fashion city. Since my sari was bought a year before the wedding almost I had ample time customizing accessories for the same. I did not want the regular looking “orhni” so , I went ahead bought a material in net and dyed it in red and kept the embossed motiffs in gold , attached gold lace with gold pears on to the edges and wallah – the customized “orhni” was done. The earrings were in antique beaten gold with red ruby color tear drop stone and had numerous collarbone length pearl drops. The mangtika which later became my hair accessory was a Rajasthani design with pearl strings and a centerpiece in red and white stones. And I had a big ring nath again customized with red and white pearls to match my sari. Oh btw, a red white and gold combination jutti kolhapuri style also sat pretty packed in a box delivered from Amazon at my office desk during the buying frenzy! 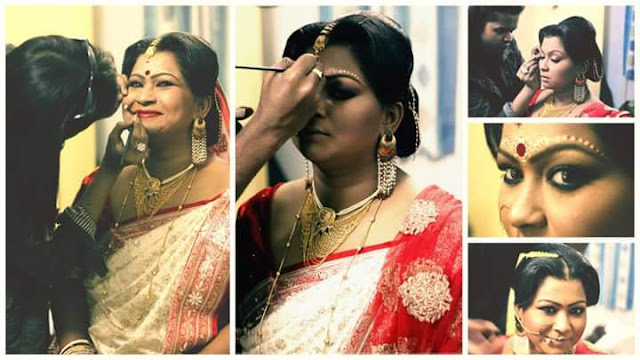 My make up was done by Kaushik Danda. I know him since I was 17. He did my make up when I had shot my 1st portfolio. He is a magician and his USP being eye makeup and the base makeup. 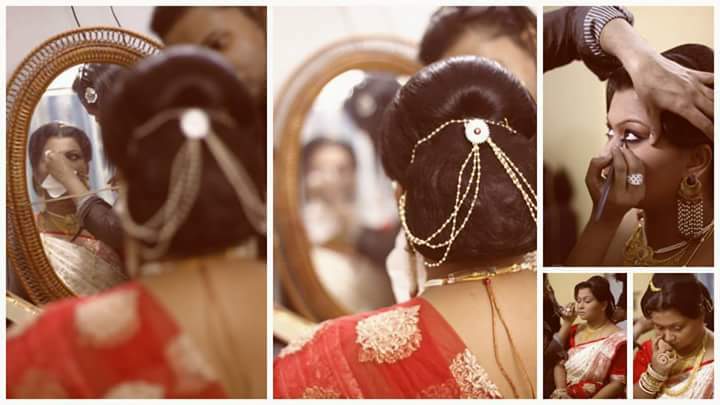 On the day of my wedding, I was busy straightening my aunt’s hair and draping my friend’s sari for her and doing her makeup. My makeup artist and hair stylist and costume didi appeared like Cinderella’s fairy godmother and transformed me within an hour’s time. I felt like a princess. The makeup was impeccable and just the way I wanted. 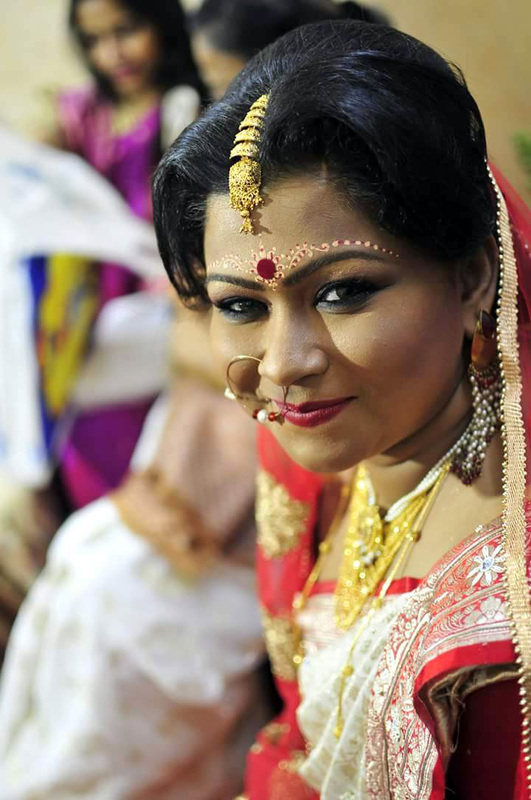 It had a hint of the modern me with slightly smoky eyes whilst the bangali sabekiana was kept intact with the intricate chandan work and the rest of the face and hair. The cherry on the cake was my mother’s imitation neckpiece of pearls that she was wearing during the day . Kaushik da being the darling ditched the gold pieces which I too was not keen on and sweetly took it from mom and put it on to me. I wore hardly any gold apart from 1 bala and 1 ring and 1 thin gold chain. I am mentally allergic to wearing gold and I detested the notion of brides having to become gold showroom models during weddings. I wanted to keep it light. I know it sounds funny but I did not have a photographer. Amongst all the things that I had to do, I forgot I needed to hire a photographer too, especially since generally for all family functions I happen to be the official photographer always. I finally caught hold of my friend, Sandipan and told him he had to do the needful. Yes, he is a professional photographer. My grandfather and mother did my kanyadaan and that was a proud moment for me. I have grown up with him and still am extremely attached to him. He passed away right 2 months after my marriage and I keep thanking my stars that he was able to be part of my day and enjoy. 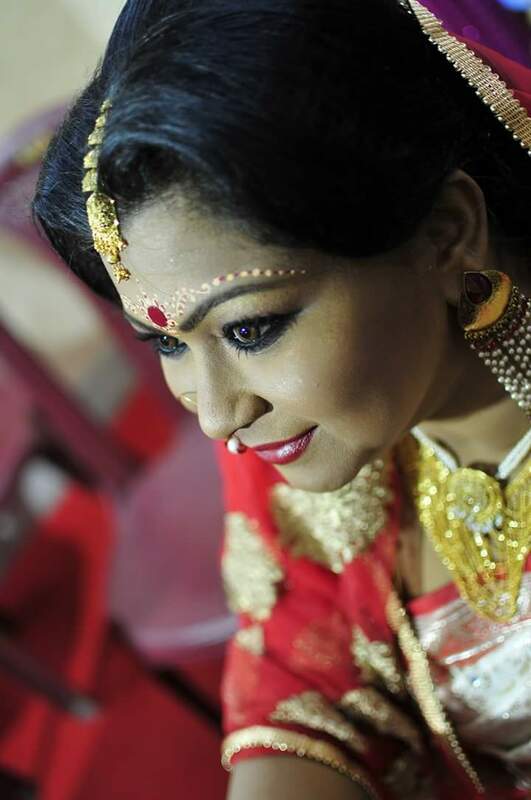 I insisted my mom see my marriage and I remember her tearing up during my sindur daan and I while sitting at the mandap was showing her big eyes and trying to say “your mascara is spilling lady”! Most of my wedding pictures have me stooping down slightly courtesy the red rose varmala which I so fondly had requested my mother for. Each was 5 kgs alone as the flower vendor it seems was overtly fond of me and my mother and made it his mission to create the bestest varmalas for me. 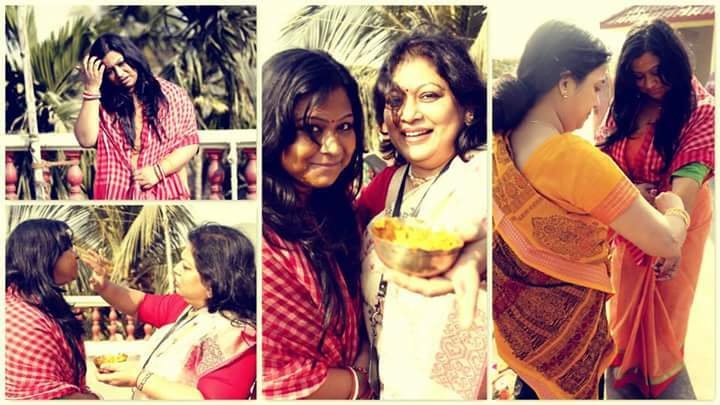 Mala Bodol was almost weight lifting for me and my face says it all in the photographs. 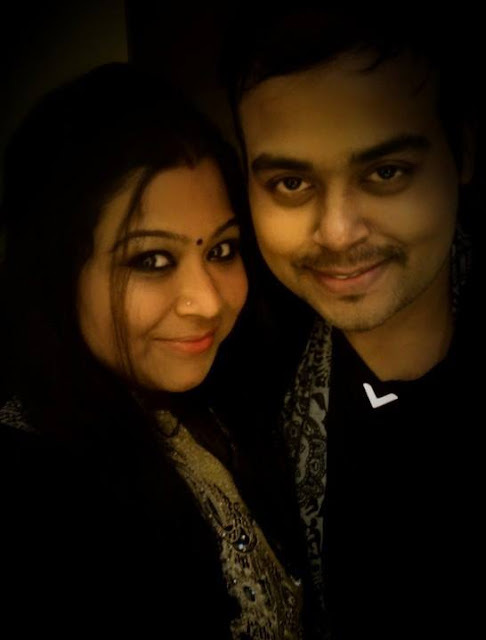 Another moment worth mentioning was – when I proposed Prantik and asked him to marry me. Lol ! I know it sounds crazzzy but I was very sure that this was the guy I wanted to spend the rest of my life with and so I got down on my knees and proposed literally. Well he too proposed later but thank god I took matters to my own hand and initiated the proposing silsila else we would have probably got hitched way later. Ladies… your marriage is your special day and I am sure everyone will tell you to enjoy it to the fullest coz it comes but once in your entire life. But I want to tell you to enjoy the preparations as much. The slow transformations, the little jitters before D-day , the tottyo sajano …all of it. And yes – when you meet your guy – Don’t wait if you know “he is the one”. Just go for it. And yes – Please do not forget your “Photographer”! OMG you call that "beautiful bride"? now there's the evidence that your blog is taking a turn for the worse. Be the creative writer you had been and stop posting crap like this. No wonder you are posting anonymously. Have guts to write your name. A pretty face is nothing if you have an ugly heart.. I am sure your ugly thoughts show on your face too.. And that's why you hide behind the 'anonymous' tag.